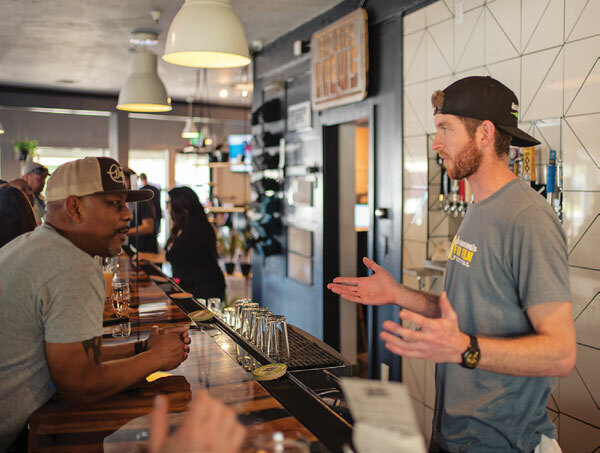 Chalk it up to word of mouth: The folks behind Sac City Brews in Tahoe Park were welcoming throngs of eager customers in January even before officially announcing their opening on social media. This taproom is all about neighbors—and their kids and dogs—gathering in a relaxed setting. A sizable shaded patio lines the perimeter of the taproom, which serves food that’s decidedly more sophisticated than your typical pub fare and pairs perfectly with the selection of local beers on tap. Device Brewing Company is launching not one but two new taprooms, the first one in midtown’s Ice Blocks complex and another slated to open later this year in the city’s Pocket neighborhood, where owners Ken and Melissa Anthony reside. Neither location will serve food, but Ken says they plan to partner with nearby eateries at both locations to provide noshes to their patrons. The midtown tasting room includes communal and individual seating as well as patio space. The spacious Pocket location is intended to cater to everyone from “parents looking to get out of the house with their kids on a Saturday to the person looking to answer a few emails while enjoying a beer after work,” says Ken. The owners of Hop Gardens in the Curtis Park neighborhood have transformed a former coffee shop into a handsome taproom that will offer wood-fired pizza and beer from 24 taps. “We wanted to bring pizza, craft beer and families together,” says co-owner Jeannine Hawkins.